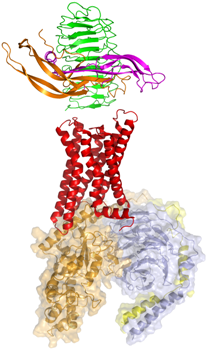 Thyrotropin receptor (TSHR), follitropin receptor (FSHR) and lutropin/chorionic gonadotropin receptor (LHCGR) belong to the glycoprotein hormone receptors (GPHRs). They are a subgroup of family A GPCRs. This database and website have been designed to function as an information source on GPHR-related topics, collating and linking data from studies on i) naturally occurring mutations and site-directed mutations, ii) structures/structural models. Our aim is to facilitate the focused investigation of GPHRs to reveal new insights into the function and malfunction of these important receptors. provides analyses of data by: focused extraction, comparison, projection and mapping on three-dimensional receptor structures and models. evaluation of data availability (including lack of information) and consistency. a 2D - snake-plot-designer ↗ for highlighting user-defined residues (helpful for researchers not so familiar with 3D features). Kreuchwig A, Kleinau G, Kreuchwig F, Worth CL, Krause G. Research resource: update and extension of a glycoprotein hormone receptors web application. Mol Endocrinol. 2011 Apr;25(4):707-12. Kreuchwig A, Kleinau G, Krause G. Research resource: novel structural insights bridge gaps in glycoprotein hormone receptor analyses. Mol Endocrinol. 2013 Aug;27(8):1357-63.